Forty bureaucrats were honoured today with Kalam Innovations in Governance Awards (KIGA) for the year 2017-2018. Minister of State for Textiles Ajay Tamta and former Secretary General of the Rajya Sabha Desh Deepak Verma felicitated the awardees. Srijan Pal Singh, Summit Convener and CEO of Dr. A.P. 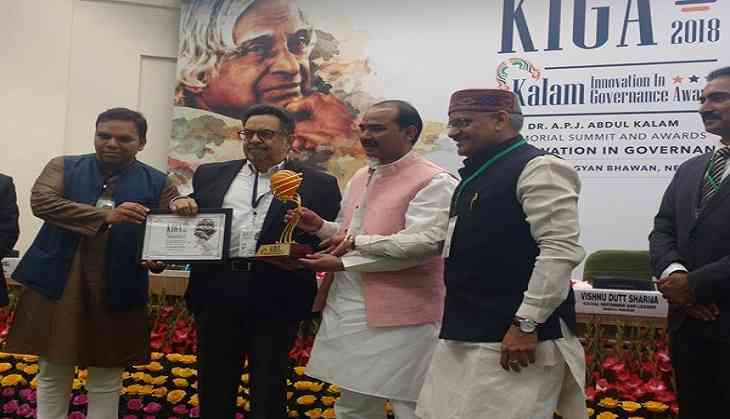 J. Abdul Kalam Centre, said, "The idea of the Dr. Kalam Innovation in Governance Awards is to create agile governance which could define the megatrends of the 21st century India. This will be multi-sectoral and people-centric so that India can not only be an economic superpower but also a socially inclusive and sustainable society." The summit is dedicated to this vision and mission of Dr. Kalam. The summit was attended by 300 officers of various services, civil services society and selected meritorious students from all over India. It is a platform to showcase, ideate, develop and award innovations in various aspects of governance, including education, healthcare, security, public service delivery, environment, technology, distress management, energy and fundamental human rights. Anuradha Mall, CEO of the Gujarat State Disaster Management Authority was awarded for her contribution to women empowerment. Manisha Chandra, Director of Women and Children Development Department in Gujarat was also awarded. Avantika Singh, an official in the administrative department of the Gujarat government was also a recipient. Anuj Dayal, Executive Director (Corporation Communications), DMRC was given the award for his constant efforts to build and sustain the DMRC brand both nationally and internationally. Kundan Kumar, District Collector of Banka (Bihar), was awarded for his project "Jal Sanchay" which focuses on water conservation in Nalanda in Bihar. Tamta said, "I congratulate all the awardees for their exemplary contribution towards the society. Dr. Kalam was one person who always thought and did what is best for our nation. We should encourage our youth towards innovation to follow Dr. Kalam's ideology. I congratulate Kalam Centre and Srijan Pal for keeping the spirit and ideologies of Dr. Kalam."